George Wilson, 24, wrote F-leit of Motif, three years ago. © 2018 - Iliffe Media Publishing Ltd. All rights reserved. A young Newmarket composer saw his music brought to life at the weekend when his score was performed by the Suffolk Philharmonic Orchestra. 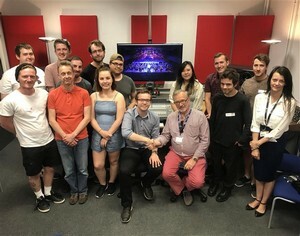 George Wilson, 24, wrote the piece, F-leit of the Motif, as part of his dissertation three years ago while studying a University of Suffolk music production course at West Suffolk College. It was performed at The Apex on Saturday night as part of the orchestra’s special Armed Forces Day concert. “It was magnificent. It’s one of the highlights of my life so far,” said George, who is from Newmarket and works at Hal Leonard Europe, formerly Music Sales Ltd, in Bury. The score was originally written for film, but was recently adapted by George for orchestra. It is inspired by Wagner’s leitmotif which is a short, recurring piece of music that reflects a certain character’s identity. Leslie Olive, conductor of the Suffolk Philharmonic Orchestra, said: “The piece is written very well for orchestra. I’m very excited about it as it has been a very happy collaboration for us. George, who was diagnosed with chronic fatigue syndrome as a teenager and developed depression as a result, first started looking at music courses at West Suffolk College to help combat his illness.